Mécanique Avion TRAction or Matra was a French company covering a wide range of activities mainly related to automobile, bicycles, aeronautics and weaponry which from 1994 was a subsidiary of Lagardère Group and which now operates under that name. Matra was owned by the Floirat family. The name Matra became famous in the 1960s when it went into car production by buying Automobiles René Bonnet. Matra Automobiles produced racing cars and sports cars, and was very successful in racing. The Matra name was first used for road cars with the Renault-powered Matra Djet (pronounced "Jet"), which was an update of the Bonnet Jet. 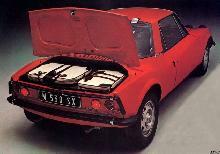 The Djet was replaced with the Matra 530, which was powered by a Ford Taunus V4 engine. Matra also developed a close partnership with Simca in the 1970s, producing Simca-engined sports cars such as the Bagheera, the Murena and the Rancho, an early type of SUV - albeit that it was two-wheel-drive - which was based on the Simca 1100 pick-up bodyshell. This car remained in production into the '80s, after Simca's takeover by Peugeot. In 1984 Renault launched the Matra built Espace minivan, a car conceived at Chrysler UK, and designed originally for Chrysler production in partnership with Matra. The car became a big success and, together with Mitsubishi Chariot and Plymouth Voyager, is credited with creating the entire market segment of modern minivans.